Two inspiring, creative women, friends since childhood, faced the same serious health issues a few years ago. 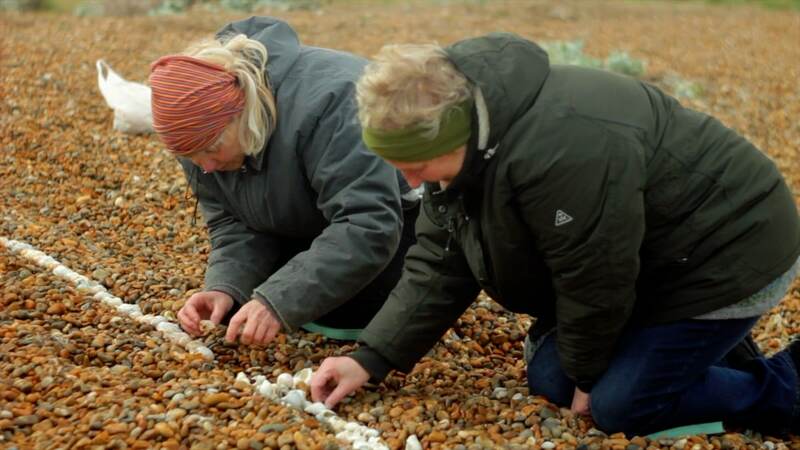 In this documentary film they reflect on the illness, their remarkable friendship and on the strength that derived from a simple, on-going creative process that inspires intrigue, delight and admiration in those who discover what they made. 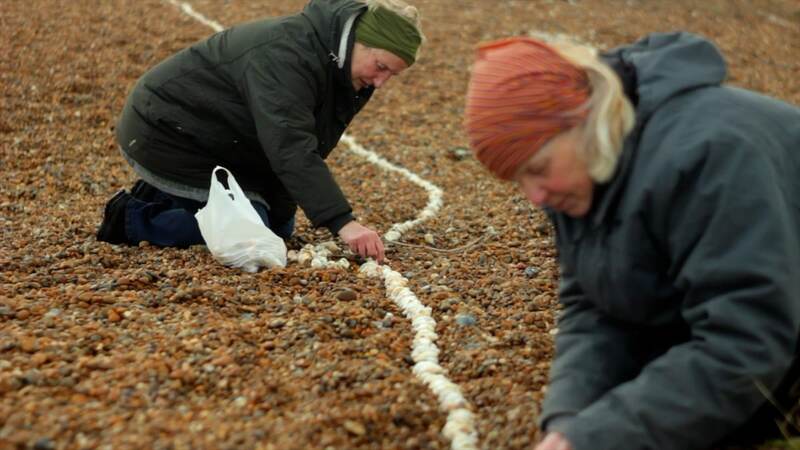 While walking on a Suffolk beach at 12:34 on 2nd January 2012 Jeremy (now with Outhouse) came across a line of shells that was clearly not a tide mark because it crossed the beach, not following the waterline, was clearly made by a person (or persons), and was clearly quite long. 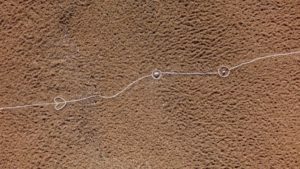 It wandered across the stoney expanse, encircling plants, diverting briefly into little designs, and protecting little mounds of shells or different coloured stones. He photographed it and wondered where it had come from. He wondered for four years, three months, 16 days … and about three hours. 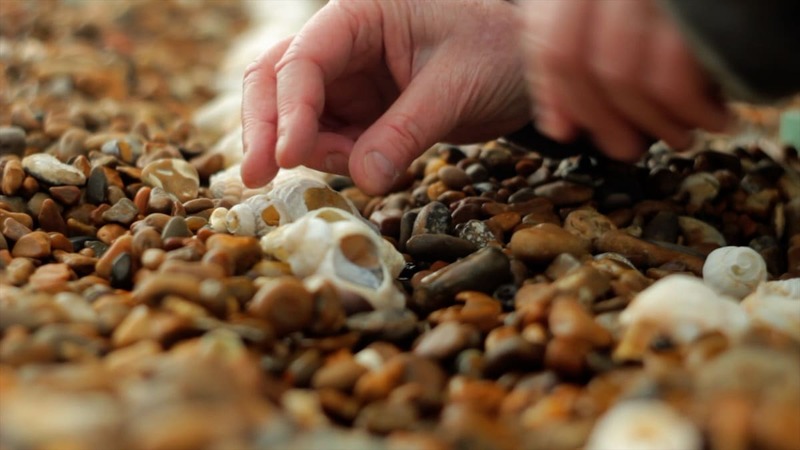 While at a poetry reading, arranged by the RSA, at a letter cutting workshop in Cambridge in April 2016 he saw a photograph of the line of shells pinned up on the wall and approached the owner of the workshop to say “I’ve seen that line”. Lida Lopes Cardozo Kindersley replied “Really? I made that line”. Later during a tour of the workshop one of the visitors asked how long it might take to get back into letter cutting after a break. Lida answered, without breaking step, “I can answer that from experience; a few years ago I had breast cancer and both my breasts were removed. It was a while before I could cut stone again but it came back to me very quickly”. Jeremy was struck by the openness and honesty of the statement: a simple fact, but very un-English in its directness. Much later that afternoon, while overstaying their welcome, Jeremy and Outhouse partner Peter struck up a discussion with Lida about the line of shells and she explained that she and her best friend from school had both suffered breast cancer at the same time and they had retreated to a cottage on a beach during their recovery process. 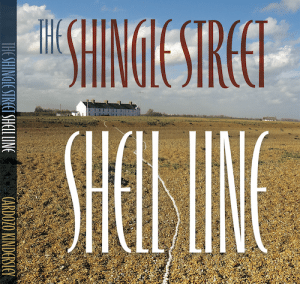 Their treatments had forced upon them all kinds of interventions and the unexpected, indeed inadvertent, creation of the “Shell Line” became part of their own, very personal, therapy. 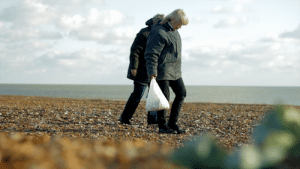 During this conversation the circle closed in Jeremy’s mind – the shell line, the illness, the therapy, above all the friendship that must have existed – and he resolved to make a short film, maybe 15 minutes at the most, of a conversation between Lida and her friend Els Bottema. Jeremy and Peter dashed back to the line on the beach the next day with their hexacopter and filmed the line from the air. This footage was edited into a short film (which you can view lower down on this page) with the express intent of convincing Lida and Els that a filmed conversation was a good idea. Lida agreed immediately on seeing it but said she would have to speak to Els first. Els’s trust of Lida allowed her to say yes too, without ever having met the two brash interlopers. 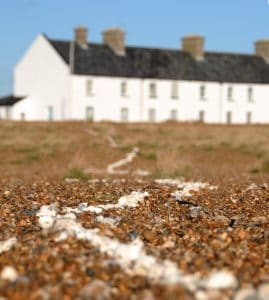 A few months later Els came to England and Peter and Jeremy joined her and Lida at the former Coastguard cottage next to the shell line. It is important to note that within 45 minutes of meeting the crew for the very first time, Els was talking, on camera, about a very intimate illness with a frankness that is breathtaking. We felt that a conversation between the two of them would allow them to be most comfortable so very few questions were asked, we just told them what part of their lives we wanted them to talk about and let the cameras roll. Lida and Els drove the whole thing. Since the film premiered back at the workshop in Cambridge, we have filmed Els at her studio in the Netherlands to replace a short section of the film that only used still photographs. This film is about a deep friendship that has spanned decades. But it has important, smaller, stories embedded within that narrative. On the face of it it is about two women who survived breast cancer. 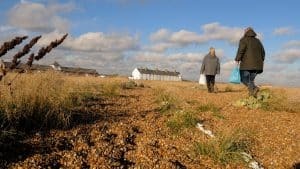 Not everyone who suffers this illness will survive and some of those who have recently been diagnosed may feel like retreating from a world that cannot comprehend the enormity of what they are facing alone. The point of this story is that it shows the strength and positivity that can be found by talking. By not retreating. By sharing. By not thinking your friends and family now live on the other side of an impassable wall. If this film makes one person reach out to share their fears (and their times of happiness) and eases their life during any dark period then it has succeeded. 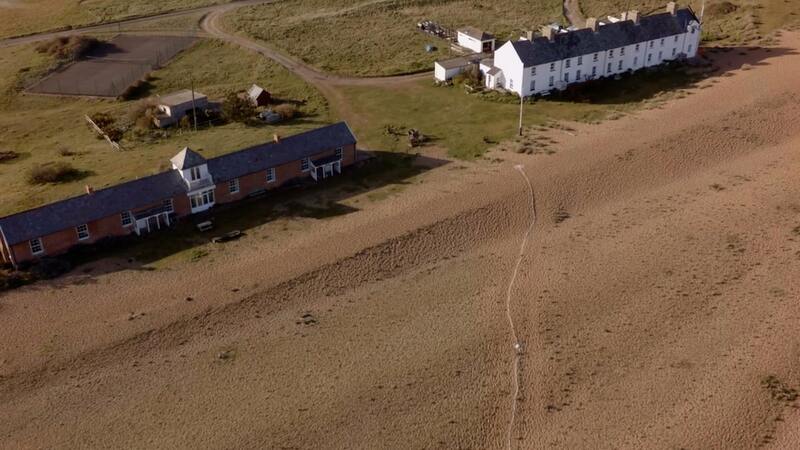 Here is the original aerial short that we used to pitch the idea to Lida and Els. 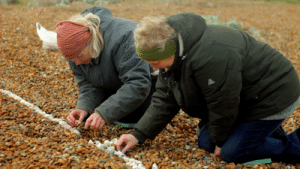 Lida and Els’s delightful book The Shingle Street Shell Line tells the story of the line, along with some interesting insights into the wildlife of Shingle Street by Jeremy Mynott. It contains stills taken from the film. The book is gaining a lot of interest following its launch at The Aldeburgh Bookshop, including an interview on BBC radio Suffolk, and a feature on The One Show (BBC TV) which contains footage shot by us. It is available from the Cardozo Kindersley Workshop, The Aldeburgh Bookshop, Heffers (Cambridge) and The Fitzwilliam Musuem (Also in Cambridge). 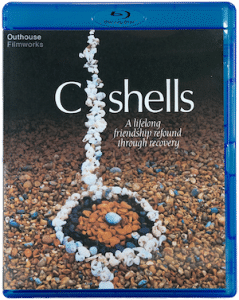 In response to many requests from people who have seen the C shells film, we are making it available on both DVD and Blu ray very soon. The cover and cases are ready so just final touches to the disks themselves remain. the full soundtrack composed by Mark Aaron, comprised of more music than is used in the film. If you would like to know when it becomes available just check back on the C shells page on this site. Even easier, if you leave us an email address we’ll get back to you. No obligation, no spam, no giving your address to anyone else, no problem. 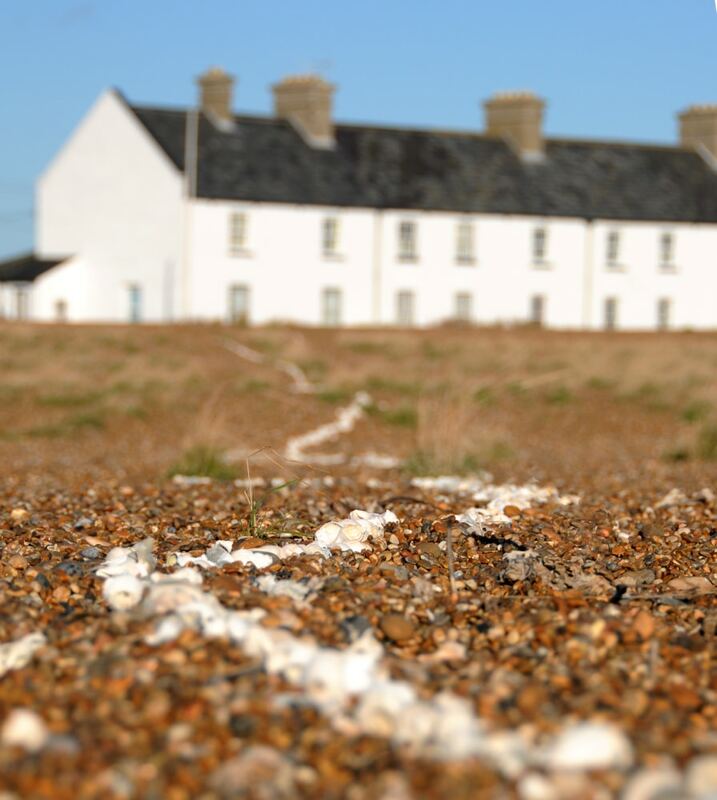 A frail, 90 year old, friend of mine was given the Shingle Street, Shell Line. As she told me about the inspiration for the book her eyes lit up and her face smiled. How precious life is. How precious friends are. Sharing time to create a simple line from nature is a beautiful journey of hope and courage and pure joy. 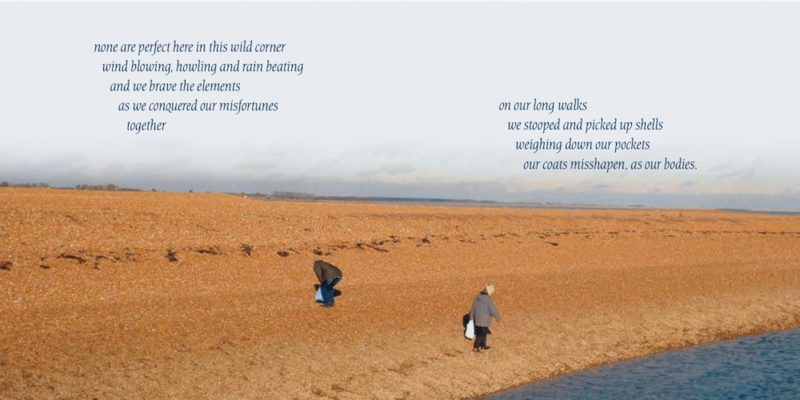 Hi, I have written a poem inspired by Els and Lida. It is called Shell Line. Id like to share it with them and not sure how. lengthening with the passing time. a path of broken, brittle curls. unfolding without plans or geometry. 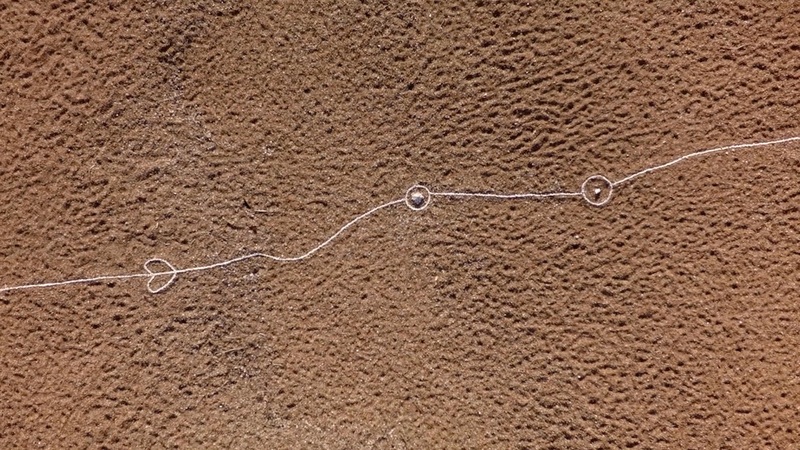 white talismans across the dunes. reach on and on as years pass by. in this low land of silent space. Thank you Helen. Clearly the line has touched you as it did us. I have passed this on to Els & Lida. Beautiful and so touching , who would not be moved by this , the story and especially the film !